I am a huge fan of the Windows Live Writer. It’s been some years now since Microsoft made this free tool available to bloggers who want to blog on Windows. And in a bold move Microsoft announced the other week that they will be moving all Windows Live Spaces weblogs (a free weblog hosting service) to WordPress. 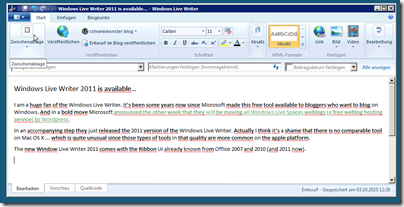 In an accompanying step they just released the 2011 version of the Windows Live Writer. Actually I think it’s a shame that there is no comparable tool on Mac OS X … which is quite unusual since those types of tools in that quality are more common on the apple platform. 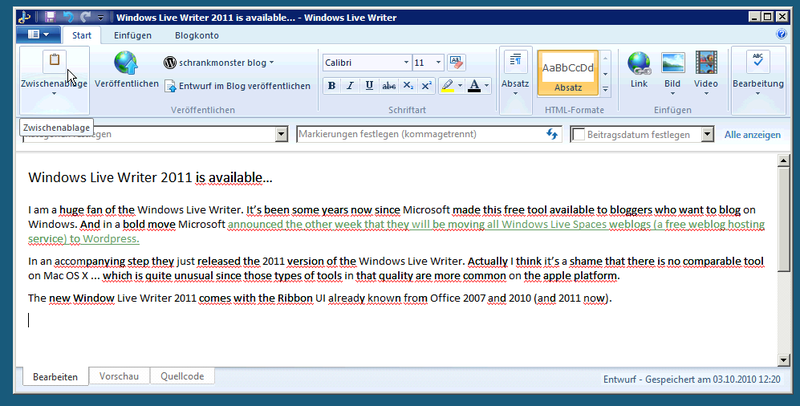 The new Window Live Writer 2011 comes with the Ribbon UI already known from Office 2007 and 2010 (and 2011 now).